I wanted to test her for strep because strep needs to be dealt with swiftly. It can result in scarlet fever or rheumatic fever. Rheumatic fever can cause lasting damage to the heart and is sometimes characterized by a raised rash that feels like sandpaper. Untreated strep can also trigger PANDAS. 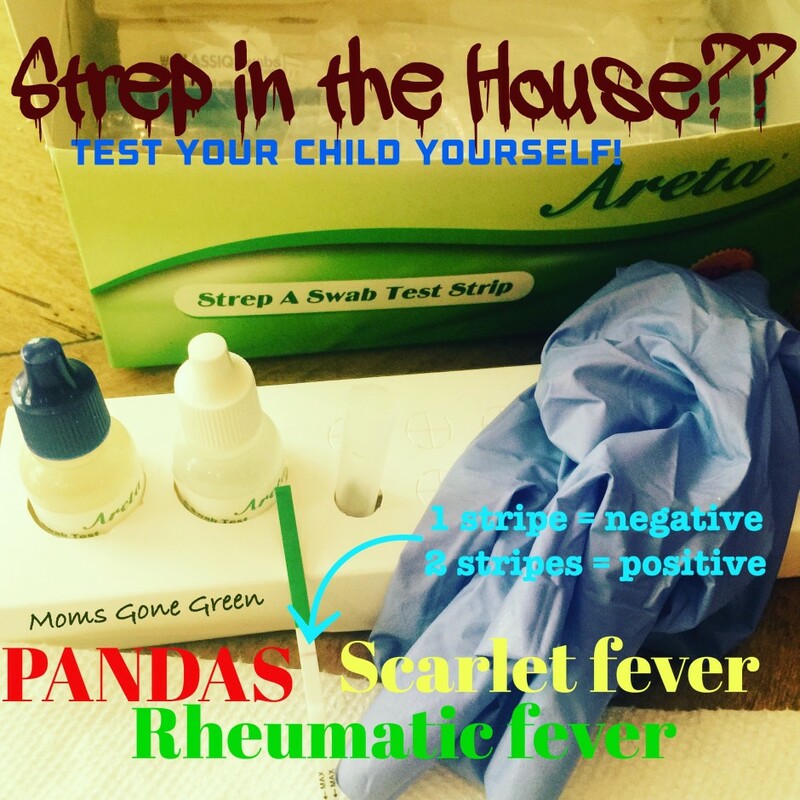 PANDAS stands for pediatric acute onset neuropsychiatric disorders associated with strep. Basically this is where you are thinking “What happened to my kid?? ?” Your kid changes in some cases overnight and in others it is gradual. They develop any or all of the following – anxiety, crying a lot, miserable, new fears, OCD, aggressive, defiant, tics, hyperactivity, schoolwork, in particular math, becomes hard, among others. For some it’s as severe as hiding under the table because they’re afraid to leave the house, for others, they still manage at school and in other social situations but all hell breaks loose at home. PANDAS wears many sad and destructive masks. When this set or a subset of symptoms listed above occur after an illness that is not strep, as one Doctor said, any disease that presents with a fever can result in profoundly affecting the disposition of a child, it is called PANS. Pediatric Acute-onset Neuropsychiatric Syndrome. The “acute-onset” is misleading as many parents have reported a gradual onset, there is currently a growing lobby of physicians and parents trying to get the “acute-onset” words changed to reflect the gradual change in the disposition of some children over the course of time. For others, though, it is indeed acute-onset and their behavior changes quite literally overnight. While there is growing awareness about PANDAS, there are many children who are sadly misdiagnosed today and given pharmaceuticals that do not address the root cause. So back to Ava, I have a rapid home strep test which is so easy to do – the hard part is getting a good swab! It tested negative. However, if you feel like you didn’t get a good swab or your child has any of the other symptoms above, it may be wise to make the trip to the Doctor’s Office. Note, in some cases a rapid test can test negative but when cultured overnight, it can test positive. I really like homeopathy for sore throats, I followed the Banerji protocol for strep that also works for regular sore throats of hepar sulph 200C mixed with bella donna 3C (the bella donna is for pain). The protocol is 2 doses a day. Ava’s sore throat started on Thursday night, I gave her one dose that night and one during the night when she woke up with the pain and 2 doses the following day and that is it. By Friday evening her pain was gone. More information on this protocol at this blog by Joette Calabrese, homeopath. Then Ava developed a mild cough and sniffles which I prefer to manage with herbs. I use homeopathy sparingly. Using too much of the right remedy or the wrong remedy can cause what is called a “proving” and have negative effects. You cannot dispense homeopathics like you can herbs and when using potencies of 200C and higher, you need to really know what you are doing. For additional support, I also gave garlic and probiotics by Nature’s Sunshine and monolaurin and as I said in less than 24 hours the worst sore throat Ava ever had was gone! I attribute this primarily to the homeopathics. Other supplements that are helpful for strep include olive leaf extract (one of my fav herbs ever), echinacea/goldenseal liquid combo (I really like this combo), Immune Stimulator, lipospheric vitamin C, andographis, and Silver Shield drops on the throat. Silver shield is a type of collodial silver – it’s not exactly collodial silver but close and to my mind it’s the safest silver on the market today. While it is highly effective and I have used to use it in the past to eradicate many sore throats, it will kill some of the good bacteria as well, additionally, it is also a metal and while the nanoparticles in Silver shield are so small and most will be metabolized out by the body, I am of the opinion that some remain, so for these reasons, I no longer use it. That said, I would use Silver Shield over an antibiotic any day. Silver shield is something that I think should be in every herbal medicine cabinet. All this said, while Ava has never been on an antibiotic and I do believe I have the remedies on-hand to manage strep (being prepared is key), if I felt like the strep was not resolving at the pace I expected – it is one of the few times, I would put her on an antibiotic. Not so much because of the risk of scarlet fever or rheumatic fever because, personally speaking, I think I could work with those – but because of PANDAS. PANDAS is a devastating disease and has impacted the lives of many children and their families. To learn more about PANDAS, click here. Help raise awareness for PANDAS, like my post on Instagram by clicking here.